We install, maintain and repair garage door openers in Kern County. King Door has the experience and expertise to service your door. Learn more today! Garage door scams are out there. King Door has tips to help you avoid them. Ronny did an excellent job replacing the torsion springs on my garage door. He was professional, courteous, and did the job fairly quickly. - John B.
I love it when I call this company asking for service on my garage door and they were able to come very quickly and not only fix the problem that I had but took the time to put my garage doors in better condition than they were brand new Jason the professional and he has literally went step-by-step to a sure that everything would be perfect and I cannot tell you how great it was to work with him. Jason the professional and he has literally went step-by-step to a sure that everything would be perfect and I cannot tell you how great it was to work with him I highly recommend this company if you have any needs having to do with garage doors they are second to none. - Glenn P.
Garage door seized and stopped, partially open...King Door repair rep. evaluated and quickly saw prob. Repaired broken parts and checked track and motor bracing. All done with friendly, informative disposition by repair rep. Rep. sprayed lubricant on track,spring, and chain completing his work...now opens/closes smoothly and noiselessly. Will certainly recommend King Door to family and friends. - Ken B. At King Door Company, Inc., we are proud to have provided residential and commercial garage doors to Bakersfield and throughout Kern County since 1985. Our selection of overhead doors is comprehensive, which means home and business owners can always find what they need in the way of garage doors, garage door openers, and accessories in Bakersfield, CA and the surrounding communities. It takes a commitment to customers to provide outstanding customer service in one of the largest counties in America. But that’s exactly what we offer, covering all of Kern County. No matter where you are and no matter your needs, we are the Kern County garage door company that promises quality, honesty and a commitment to going above and beyond in service to customers like you. Whether we’re servicing your garage door in Kern County, CA or welcoming your family to our 4,000-square-foot showroom in Bakersfield, CA, you can expect our team to embody our promised values. From start to finish, we dedicate ourselves to making you not only feel welcomed but also cared for by a team you can trust. That’s why we encourage your questions, as well as curiosity. Ask about our brands of garage doors, our garage door installation services to the Bakersfield, CA area, our garage door repair and 24/7 emergency services and anything else that comes to mind — we’re always happy to help and provide you with honest answers that let you make an informed decision. 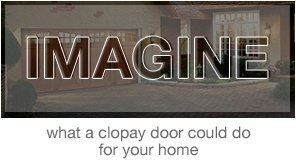 As a respected Clopay® and LiftMaster dealer, we ensure our garage doors and openers match our promise of quality. In fact, Clopay builds all its garage doors to order, delivering a garage door to your Bakersfield, CA home — or nearby residence in Kern County — that’s beautiful and safe, as well as within your budget. Our before-and-after garage door installations from around Bakersfield, CA demonstrate not only the beauty of our available garage doors but also the expertise of our knowledgeable team. For all garage door installs, we arrive at your home with high-quality installation materials, like our U.S.-made galvanized torsion springs, complete your installation with care and then leave your home as we found it — clean and neat. King Door offers products and services that reflect years of experience and knowledge. When you need overhead door installation, service, maintenance or repair at a home or business, you won’t find a better provider than King Door Company, Inc. of Bakersfield. Count on us for a wide range of residential garage door styles and accessories, as well as different types of commercial garage doors in Kern County. Throughout the over 30 years we’ve spent serving Bakersfield and Kern County, we’ve developed a strong sense of community and a deep desire to give back. That’s why we choose to support area veterans through our partnership with Paralyzed Veterans of America, Local Ronald McDonald House in Bakersfield, and other causes in this region. Don’t settle for anything less than the best when you need residential or commercial garage door installation, service or repair in Bakersfield, CA. 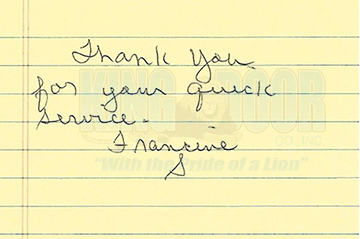 Get in touch with the team at King Door Company, Inc., With the Pride of a Lion™. 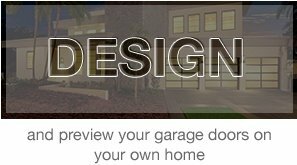 Request a quote today or visit our showroom to see the garage doors and accessories available to you. Same-Day Garage Door Repair Service: Every day, you rely on your garage door. We understand. That’s why we provide same-day gage door services for the Bakersfield, CA community. Our team’s also available 24 hours a day, ensuring you always receive immediate assistance when you need it. Broken Garage Door Spring Changes: As garages age, it’s normal that their springs require replacement — after all, they’re helping your garage door lift and lower multiple times a day. Due to the danger of torsion springs, it’s critical you have the assistance of a professional, which is what King Door delivers. Garage Door Opener Repair & Replacement: Every one to two years, a professional should inspect your garage door opener. At King Door Company, Inc., our team keeps you in the loop, notifying you about needed repairs or discussing the possibility of replacing your opener. Garage Door Replacement: Like your car, your garage door will eventually require replacement with continued use. As a part of our commitment to honesty, we only recommend a new garage door installation to Bakersfield, CA homeowners if necessary for your family’s safety and convenience. Garage Door Window Replacements: A variety of events can lead to damaged garage panels or windows, from a car accident to a severe storm. We’re here to help, though. As a part of our garage door services to the Bakersfield, CA area, we offer high-quality, affordable window replacements. Learn more about our residential and commercial garage door services by contacting us today!